The Early Archaic is generally viewed as the period when native populations began to adapt to an environment created by Holocene climatic conditions - conditions very similar to those of today. The Early Archaic in the Piedmont has been divided into two parts, the Palmer phase (8000 - 7000 B.C.) and the Kirk phase (7000 - 6000 B.C.). Available subsistence information suggests that Early Archaic plant food collection focused on hickory nuts and acorns. Archaeologists presume that white-tailed deer provided the main source of meat. A dramatic increase in Early Archaic sites across the state suggests an increase in the overall population. 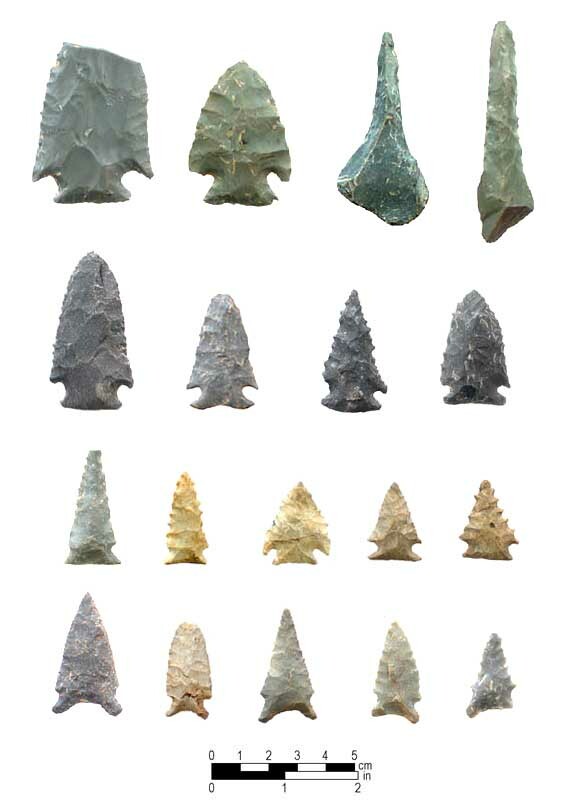 Small Dalton (or "Hardapalmer") (bottom row), Palmer Corner-Notched (third row), and Kirk Corner-Notched (top, left two specimens and second row) spear points, and chipped-stone drills (top row, right two specimens) from the Hardaway site. Although subsistence strategies on the Piedmont changed little from those of the Late Paleo-Indian period, Early Archaic tool kits did change. New ways of attaching spears resulted in marked changes in the way points were made. During the Palmer phase (8000 - 7000 B.C.) 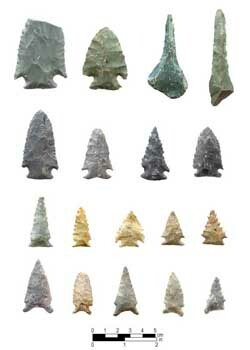 small, well-made end scrapers characteristic of the Late Paleo-Indian subperiod continued to be made. During the Kirk phase (7000 - 6000 B.C.) scrapers were cruder and varied greatly in size and form. Adzes, gravers, drills, and perforators were made for working wood, hides, and animal bones into tools and ornaments. Cobbles were used as hammers and anvils to fashion other tools or crush and grind plant and animal resources. Ground-stone tools are rare during the Early Archaic. Models of Archaic settlement proposed for North Carolina, South Carolina, and Georgia by Anderson and Hanson (1985) (a) and Daniel (1994) (b). Early Archaic inhabitants were organized into small mobile bands (probably numbering 50 - 150 individuals). The North Carolina Piedmont offered a cornucopia of plant and animal foods, so the distribution of food resources may not have determined band territories. Some researchers believe Early Archaic bands ranged over entire drainage systems, while others believe that band territories were related to important stone resources and thus overlapped drainages.